MONROE, La., Sept. 11, 2018 /PRNewswire/ -- The rise of over-the-top (OTT) video services has created a new demand for traditional broadcast television channel delivery to cloud-based media services and workflows. 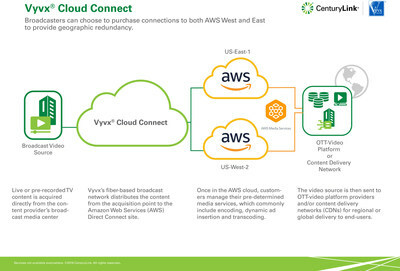 CenturyLink, Inc.'s (NYSE: CTL) Vyvx suite of fiber-based broadcast services now provides secure, high-performance connectivity into Amazon Web Services (AWS), including AWS Elemental Media Services, via AWS Direct Connect. Called Vyvx Cloud Connect, the new network service provides broadcasters as well as studios and stadium venues across the United States an easy path for getting live and linear video into and out of the cloud. "While cloud-based workflows make live OTT-video delivery significantly more scalable and agile, the delivery of that content from TV broadcast centers into the cloud to prepare it for Internet-based delivery is still dependent on broadcast distribution networks," said Jim Davis, contributing analyst at Structure Research. "With this service, the CenturyLink Vyvx network can directly route broadcast TV content to AWS and give customers peace of mind knowing their streams are managed, monitored and protected." With Vyvx Cloud Connect, programmers can deliver full-time channels as well as occasional-use content directly to AWS for easy and reliable broadcast-quality workflows on the cloud. This service routes, protects and monitors customers' broadcast streams, providing multi-region, diverse connectivity paths to AWS. "Programmers need a managed, monitored solution that is redundant, reliable and scalable," said Bill Wohnoutka, CenturyLink vice president of global internet and content delivery services. "CenturyLink's Vyvx Cloud Connect enables our broadcast customers to leverage the benefits of cloud-based workflows to streamline, simplify and monetize their content." Once connected to AWS, customers can easily and securely contribute video content to AWS Elemental Media Services, including AWS Elemental MediaLive, AWS Elemental MediaPackage and AWS Elemental MediaStore, which are available natively through AWS. Customers also are able to deploy and route traffic to other AWS services available on AWS Marketplace, paying only for what they use as their operations and needs scale. Vyvx customers now have direct access via AWS Direct Connect to AWS Elemental Media Services. This service routes, protects and monitors customers' broadcast streams. Along with AWS Elemental Media Services, customers can access the full breadth of third-party media services available in the AWS Marketplace. Vyvx Cloud Connect offers full multi-region, diverse connectivity paths into AWS. This is a fully managed Vyvx service to the demarcation point into AWS.